The Multi Award winning Formula Fast Indoor Go Karting group has moved to a brand new, bigger location near Milton Keynes just a stone's throw away from MK Stadium. The circuit provides corporate and private events, conferencing, open races, hire kart practice (including family sessions), junior parties, championships and in-house tuition. 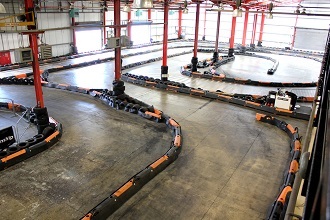 High levels of safety are guaranteed at this track, which will give you the confidence to push the 200cc Sodi GT5 racing machine to the limit, whilst the state of the art facilities and fantastic mezzanine lounge, VIP and bar area provide a comfortable setting to relax when you're not behind the wheel. Leave the M1 at Junction 13 and follow the A421 up to the V11 (Tongwell st) roundabout and take the first exit left. At the next roundabout take the A4146 (H10) and carry on until the fifth roundabout, Bond Avenue junction where you take the second exit northbound. Formaula Fast is just off the third exit on your right. An exclusive event for 12 - 18 drivers; 10-laps qualifying to determine your grid position then a non-stop 15-minute race. An exclusive event for 6 - 9 drivers; 10-laps qualifying to determine your grid position then a non-stop 15-minute race. An exclusive event for 12 - 18 drivers; 10-laps qualifying to determine your grid position then a non-stop 20-minute race. An exclusive event for 6 - 9 drivers; 10-laps qualifying to determine your grid position then a non-stop 20-minute race. An exclusive event for 6 - 9 drivers; 10-laps qualifying to determine your grid position then a non-stop 30-minute race. Exclusive use of the circuit for a 10-minute in-kart tuition plus a 20-minute junior sprint race for up to 6 kids. All racegear provided, Full briefing and verbal quiz, 6 drivers on track per session, Drivers ranked by fastest lap, Podium presentation, Prizes for birthday & fastest driver, Laptime Data Sheets, Birthday Cake included. Exclusive use of the circuit for a 10-minute in-kart tuition plus a 30-minute junior sprint race for up to 6 kids. All racegear provided, Full briefing and verbal quiz, 6 drivers on track per session, Drivers ranked by fastest lap, Podium presentation, Prizes for birthday & fastest driver, Laptime Data Sheets, Birthday Cake included. Exclusive use of the circuit for a 10-minute in-kart tuition plus a 20-minute junior sprint race for up to 12 kids. All racegear provided, Full briefing and verbal quiz, 6 drivers on track per session, Drivers ranked by fastest lap, Podium presentation, Prizes for birthday & fastest driver, Laptime Data Sheets, Birthday Cake included. Exclusive use of the circuit for a 10-minute in-kart tuition plus a 30-minute junior sprint race for up to 12 kids. All racegear provided, Full briefing and verbal quiz, 6 drivers on track per session, Drivers ranked by fastest lap, Podium presentation, Prizes for birthday & fastest driver, Laptime Data Sheets, Birthday Cake included. Various venue hire options are available for corporate groups, provide us with details of your group size, and we will provide you with options to select from.